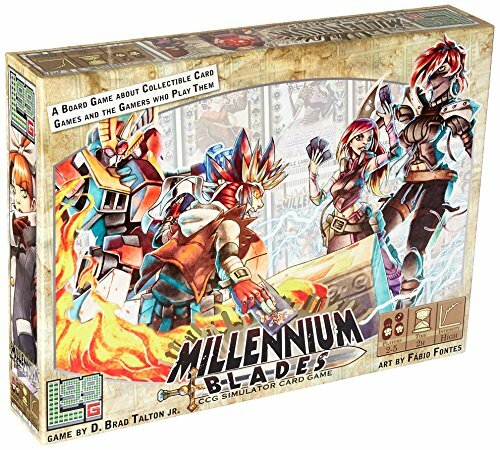 Designers: D. Brad Talton, Jr.
Millennium Blades is a board game about a fictional collectible card game, which is also called Millennium Blades. You begin the game on pre-release night with just your starter deck. You'll open new packs, form collections, and sell your junk cards on the aftermarket to buy hot new cards. Trade with your friends, build up your deck, and prepare to compete at Millennium Blades Worlds for the title of World Champion! This is a game about competitive deck building. You get a limited pool of cards, and then you tinker them into the most unfairly over-powered, table-flippingly broken deck that you can imagine. And your deck had better be pretty crazy, because your opponents won't be giving any quarter, and they all have unique collections with access to their own high-tier power cards. In addition to deckbuilding, you'll be speculating on blind pack buys, selling and buying cards on the aftermarket, and fusing your cards to make rarer and better ones to get an advantage over the competition. You might even make a few friends, if you're willing to help them out.